CORNERSTONE DESIGNS for AIMEE'S BOUTIQUE -- ROSE QUARTZ AUTHENTIC STONE WITH CLEAR ICE QUARTZ. AND YELLOW GREEN JADE THAT LOOKS LIKE FROSTED PINEAPPLE! EXTRAORDINARY HANDCUT GEMS --THESE ARE SOOOO XL! I can add adjustable chain to your custom-desired length FREE: XL masterpiece which is NOT FOR THE FAINT OF HEART! AND A million times better in peson. These look amazing as a royal collar for your neck. Wonderful designs by the Lord himself. Rose quartz is one of the most desirable varieties of quartz. The pink to rose red color completely unique, unlike any other pink mineral species. The color is caused by iron and titanium. Rose quartz is found in Madagascar, India, Germany and several localities in the USA--including right here in southern California. Much rose quartz was extracted from a famous site near Custer, South Dakota, but now, most of the worlds supply of good carvable rose quartz comes from Brazil. Brazil is also the only source of true well formed crystals of rose quartz. All rose quartz was believed to be only massive, found primarily in the cores of pegmatites. This lack of crystals is somewhat of a curiosity because quartz crystallizes into well formed crystals in all its other macroscopic varieties. So amazing are the rose quartz crystals that the first ones discovered were dismissed as fakes by mineralogists from around the world. Jade has been treasured in China as the royal gemstone, "yu" for 5,000 years. The character for jade resembles a capital I with a line across the middle: the top represents the heavens, the bottom the earth, and the center section, mankind. The word "yu" is used in Chinese to call something precious, as in English we use gold. For thousands of years, jade was a symbol of love and virtue as well as a status symbol. In Central America, the Olmecs, the Mayans, the Toltecs all also treasured jade and used it for carvings and masks. The history of jade in Europe is not quite as distinguished. Although prehistoric axes and blades carved from jade have been found by archeologists, most Europeans were unfamiliar with jade as a gemstone for jewelry use until the sixteenth century when jade objects were imported from China and, later, Central America. All pieces are handmade by me with creations from God's earth. My pieces are in boutiques from Tampa to Hollywood (Rhonda Shear / Linda McNair Boutique). Right now I have many creations so it is your chance to get a one-of-a-kind piece for a fraction of the retail price. PLEASE SEE OUR OTHER BEAUTIES IN AIMEE'S BOUTIQUE! AMAZING PINK GEM AND STARFISH PENDANT NECKLACE. CZECH GLASS QUARTZ SHOWPIECE NECKLACE. CHUNKY RAINBOW FREEFORM TURQUOISE NECKLACE. SMASHING TURQUOISE IN aqua AND lime SHADES - BIG. STATEMENT NECKLACE - DRUZY AMETHYST AND AQUA QUARTZ! COLORFUL 3STRAND CORAL AND TURQUOISE GEMSTONE NECKLACE. AMETHYST DRUZY AGATE PENDANT HEIRLOOM PIECE! GENUINE RAW LEMON QUARTZ ON GOLD. AS SEEN AT NEIMAN MARCUS AQUA QUARTZ ICE NECKLACE. GREEN AGATE AND ABALONE SEA OPAL NECKLACE! CORAL PINK HUGE CHUNKY RAW BIG NECKLACE. OVERSIZE REAL SHELL PENDANT FLOWER AND KIWI QUARTZ! REAL STARFISH AND NATURAL QUARTZ. ALL NATURAL DRUZY AMETHYST EARRINGS. PINK GOLD VEIN TURQUOISE PENDANT NECKLACE. SPLENDID DRUZY AQUA BLUE SHOWPIECE - BIG. NATURAL TOP GRADE LAPIS LAZULI NECKLACE. REAL HOUSEWIVES OF NY TURQUOISE EARRINGS - BIG LG. TOP GRADE DRUZY QUARTZ RIBBON NECKLACE. STUNNING TRIPLE STRAND CHERRY QUARTZ! PURPLE DRUZY AMETHYST CRYSTAL GEODE NECKLACE - GLISTENING! OLIVE QUARTZ CHUNKY MULTI STRAND STUNNER! NATURAL PYRITE FOOL'S GOLD NECKLACE!! REAL STARFISH PENDANT 4-STRAND AQUA QUARTZ NECKLACE BIG. DRUZY AMETHYST CRYSTAL PENDANT WITH ROSE QUARTZ. MOST BEAUTIFUL GENUINE AFRICAN TURQUOISE GEMSTONE RING - MANY SIZES! SEPTARIAN DRAGONSTONE DRUZY PENDANT NECKLACE CAMO BIG. PURPLE AND HOT PINK AMETHYST GEMMY DRUZY PENDANT NECKLACE. HUGE TOP GRADE SLAB TURQUOISE NECKLACE - BIG ART < /a>. PURPLE DRUZY PENDANT NECKLACE BIG MO PEARL GEMS. BLACK AND WHITE DIAMOND FINE JEWELRY! SIMPLE LUXURY PINK AGATE BRUSHED SILVER NECKLACE. PINK GENUINE JADE NECKLACE WITH SILVER. HUGE AQUA QUARTZ DOUBLE BRACELET ASA NEIMAN MARCUS! TROPICAL TURQUOISE SHELL NECKLACE XL. MOTHER OF PEARL STUNNER WITH FLOWER PENDANT. AQUA QUARTZ LAYERED MULTI STRAND BIG NECKLACE. ICE CUBE QUARTZ EXTRA CHUNKY NECKLACE. STUNNING HOT BERRY PINK TURQUOISE NECKLACE CHUNKY SHOWSTOPPER. DRUZY PENDANT WITH AGATE AND BRONZE BIG. STUNNING AQUA QUARTZ TURQUOISE COLORED NECKLACE LG. JUICY CITRINE DRUZY PENDANT NECKLACE RAW BIG COUTURE LG. BLUE TURQUOISE AGATE MULTI STRAND NECKLACE. CHUNKY GENUINE TURQUOISE WITH GOLD PENDANT NECKLACE BIG. STERLING SILVER ROSE RING - WOW! CLEAR QUARTZ BEAUTY -- BIG. MOROCCAN DRUZY GEODE PENDANT AND AGATE NECKLACE SILVER. HOT PINK FRANGIA DRUZY GEODE HEART PENDANT NECKLACE BIG. GEMSTONE STATEMENT NECKLACE -- BIG. AMETHYST BOULDER NECKLACE - CHUNKY PURPLE. BIG TURQUOISE MULTI GEMSTONE NECKLACE W SILVER. AMETHYST AND AQUA QUARTZ ICY NECKLACE. MULTI COLORED AGATE FACETED AND STERLING SILVER. GENUINE DELICIOUS ABALONE AND PINK JADE NECKLACE. TURQUOISE COLORED GENUINE JADE TRIPLE STRAND SHOWPIECE. TURQUOISE TOP GRADE CHUNKY MOST AWESOME NECKLACE & lt; /a>. PALE MINT GREEN CHALCEDONY WITH GOLD DETAIL. SHEER BLUE ICY QUARTZ GOLD NECKLACE < /A>. CHUNKY STATEMENT NECKLACE - WOW! HUGE GENUINE GOLD DRUZY PENDANT PINK AGATE NECKLACE. GENUINE GREEN DRUZY AGATE NECKLACE GERMAN SILVER BIG. DRUZY AQUA GEODE EARRINGS NECKLACE. HUGE TURQUOISE JADE GUMBALL NECKLACE. STUNNING BRONZE RHINESTONE MEDALLION PENDANT NECKLACE. TOP GRADE OVERSIZED RAW AMBER. AQUA FACETED QUARTZ BIG NECKLACE. CLASSIC JADE GENUINE 3STR GREEN NECKLACE. PINK GOLD VEIN TURQUOISE BIB GEMSTONE NECKLACE < /a>. TOP GRADE STUNNING GENUINE AMBER FRUIT CHUNK NECKLACE. GENUINE LAPIS LAZULI DOUBLE STRAND SHOWPIECE! CITRINE JUICY DRUZY CRYSTAL PENDANT NECKLACE COUTURE LG. RASPBERRY DRUZY AMETHYST AND TURQUOISE - PENDANT BRIDAL BIG. RASPBERRY DRUZY AGATE, PEARL, QUARTZ MEDLEY. TOP GRADE LAPIS LAZULI GEMSTONE NECKLACE XL. VANILLA CRYSTA MULTI STRAND BRIDAL SHOWPIECE NECKLACE. AMAZING PURPLE DRUZY AMETHYST SHOWPIECE -BIG GEMS. AS SEEN AT NEIMAN MARCUS - AQUA SUGARY GEMSTONE NECKLACE. YUMMY PINK MOCHA AGATE SLAB NECKLACE. RAINBOW GENUINE CORAL CHUNKY NECKLACE. SOFT BLUE AND DRUZY GEMSTONES! TURQUOISE AND RED CORAL GEM NECKLACE SILVER BALI < /a>. 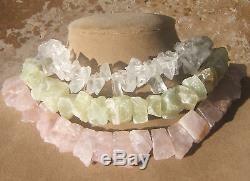 RAINBOW QUARTZ MULTI STRAND NECKLACE. ICE DRUZY PENDANT CRYSTAL EARRINGS SILVER HOOPS - RAW BIG GEMS. HUGE CHUNKY LAPIS LAZULI NECKLACE BIG PAGEANT BRIDAL. AQUAMARINE LAYERED GEMSTONES & RHINSTONE PENDANT. ROUGH AQUA QUARTZ EARRINGS SET - STUNNER! DELICIUOS FRESH ORANGE TURQUOISE EXOTIC DISKS! PINK MOROCCAN DRUZY PENDANT WITH PINK AGATE < /a>. GENUINE DRAGON TURQUOISE WITH COPPER. PINK CHERRY QUARTZ NECKLACE BIG PAGEANT BRIDAL PARTY! TEARDROP TURQUOISE MULTI STRAND SHOWPIECE! The item "ROSE QUARTZ LOVE PINK YELLOW WHITE NECKLACE CRYSTAL JADE BIG TRIPLE STR JEWELRY" is in sale since Wednesday, June 9, 2010. This item is in the category "Jewelry & Watches\Handcrafted, Artisan Jewelry\Necklaces & Pendants". The seller is "cornerstonejewels" and is located in Beverly Hills, California. This item can be shipped worldwide.